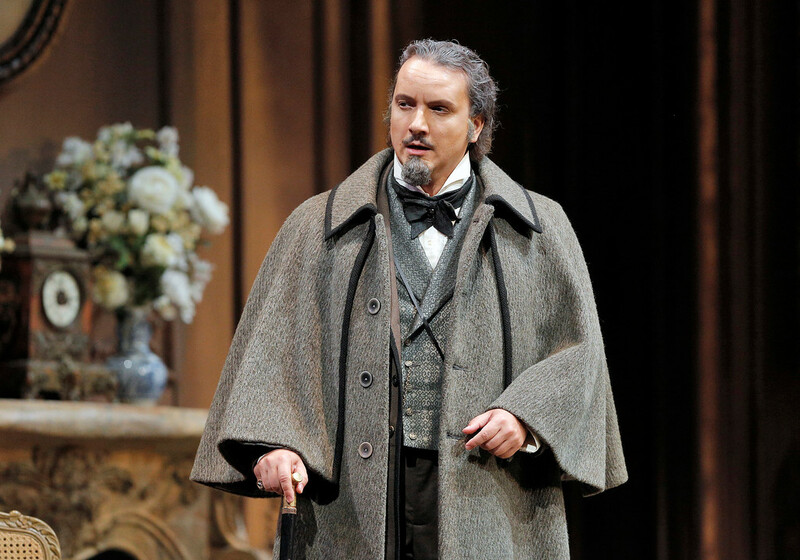 Artur Rucinski as Giorgio Germont, in Verdi’s “La Traviata.” Photo Credit: Cory Weaver/SF Opera. Sometimes a soufflê just won’t rise. “La Traviata” boasts one of the loveliest scores in the entire Verdi repertoire with soaring melodies, thrilling orchestrations, charming choruses, and exquisite opportunities for bel canto singing. But, even the loveliest music and most enticing story requires some commitment on the part of the artists to make it thrill. For the current pedestrian production at SF Opera, the phrase “phoned it in” seems the most apt description. The notes are sung, the orchestra is lilting, the sets are lovely, but the overall effect is more like a decent recording than a great opera performance. As Violetta Valéry, Aurelia Florian makes an inauspicious debut with the San Francisco Opera. She sings adequately, but the stakes for which she is playing do not seem to be very high. Not only does she not convince us that she is in love with Alfredo Germont, she does not even convince us that she is capable of great love. How did this woman become the most famous and admired courtesan in Paris? One is left to wonder. An unconvincing Violetta is a blow to the opera from which it is not really possible to recover. But it should be noted that there is some excellent singing by Arthur Rucinski as Giorgio Germont. The setting is lovely, the chorus is fine, the orchestra adequate, the overall effect not quite soporific. One can only imagine what dark demon of ennui haunted the War Memorial Opera House on the night I attended, and very much hope that it was just one of those unfortunate “down” performances that occasionally afflict even the finest artists. “La Traviata” will play for two more performances, this evening Saturday, October 14th and Tuesday, October 17th. “La Traviata” by Giuseppe Verdi. Libretto by Franceso Maria Piave. Based on the play “La Dame Aux Camélias” by Alexandre Dumas, fils, produced by San Francisco Opera. Conductor: Nicola Luisotti. Production: John Copley. Stage Director: Shawna Lucey. Set Designer: John Conklin. Costume Designer: David Walker. Lighting Designer: Gary Marder. Chorus Director: Ian Robertson. Choreographer: Carola Zertuche. Violetta Valéry: Aurelia Florian. Doctor Grenvil: Anthony Reed. Baron Douphol: Philip Skinner. Flora Bervoix: Renée Rapier. Marquis d’Obigny: Andrew G. Manea. Annina: Amina Edris. Gastone: Amitai Pati. Alfredo Germont: Atalla Ayan. Giuseppe: Christopher Jackson. Giorgio Germont: Artur Rucinski. A messenger: Bojan Knezevic. Flora’s servant: Torlef Borsting. Solo dancers: Lorena Feijoo, Blanche Hampton and Bryan Ketron. Posted in Reviews.Tagged Charles Kruger, La Traviata, SF Opera, theatrestorm, Verdi.